Glomus jugulare tumors are the most common tumors of the middle ear. Usually slow-growing, they arise from glomus bodies located within the ear. These are very vascular tumors with blood supply from the external carotid artery and internal carotid artery. These tumors are much more common in women. These tumors are diagnosed by neurophysiological testing (audiometric and vestibular), CT-scan or MRI imaging. In addition, an endocrine work-up is performed for catecholamines. Laboratory tests include blood and urine collection to detect catecholamine secretion. Treatment involves medical therapy, surgical therapy, and radiation therapy. • Medical therapy: for tumors that actively secrete catecholamines, medical therapy is useful for palliation or as adjunctive treatment before surgery. Alpha and beta blockers are given before surgery to block possible lethal blood pressure lability and arrhythmias of the heart. • Surgical treatment: These tumors are very vascular, therefore, pre-operative embolization of the blood supply to the tumor is often performed. The complications of surgery are persistent leakage of cerebrospinal fluid from the ear, and also damage to one of the nerves controlling face movement, sensation or hearing. 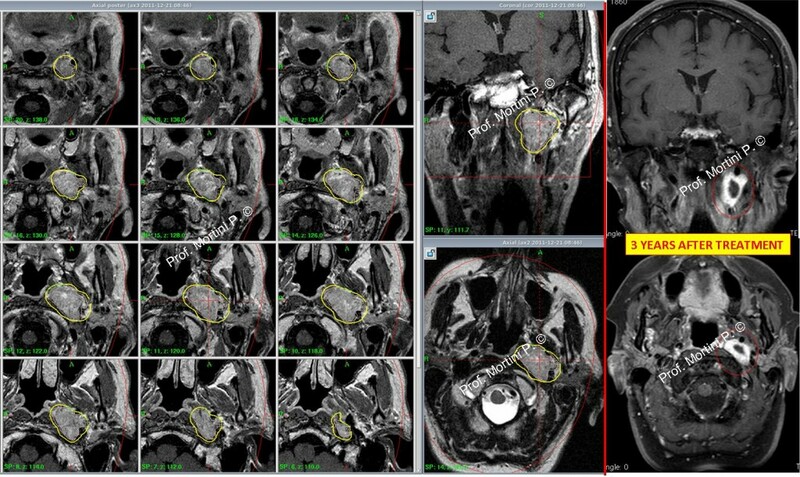 Even though the surgery may be successful glomus jugulare tumors are somewhat problematic because they have a high recurrence rate and may require multiple operations. • Radiation therapy: Radiation may relieve symptoms and stop growth in spite of persistent tumor mass.